BlackBerry can browse web, send and receive messages, play music and take photos. But you surely want something more than these. For instance, put your precious DVD collection onto your latest BlackBerry Z10 for on-the-go watching. The devoid of DVD drive causes the question of how to convert DVD to BlackBerry to increase in frequency. Don’t get irritating about this. This tutorial will share something you really appreciate. The success rate of converting DVD movie for BlackBerry boils down to the DVD ripping program you choose. To name a few, is it capable of stripping off copy protection schemes? Can it convert DVD to a video format supported by BlackBerry of all types, e.g. the latest BlackBerry Q10/Z10? How about the output video quality or the DVD ripping speed? It seems there are so many factors to be taken into consideration when choosing a DVD to BlackBerry ripper. Don’t mess around with it. 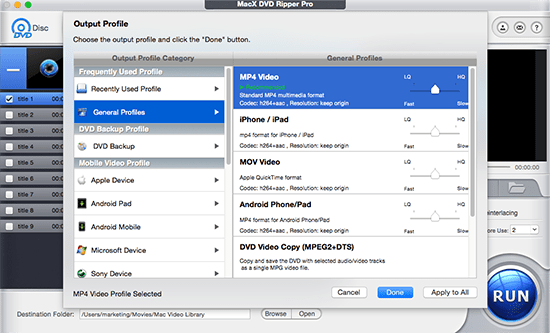 MacX DVD Ripper Pro is really the time-proved software you can rely on. With tens of thousands of thumbs up from Mac users, this tool is absolutely the one worth of your choice. It gives you the ability to convert DVD into a file that you can play on your BlackBerry. Particularly, the latest enhancement directly brings profiles for BlackBerry Q10/Z10, Bold 9900/9930, P'9981, etc, with both performance and speed improved. This DVD converter software empowers you to fast convert DVD to BlackBerry(also copy protected DVD) with 1:1 video image quality. Kick off this DVD ripper on Mac, click "DVD" button to import source DVD disc. To play DVD movie on BlackBerry, you can simply navigate to Other Devices to select BlackBerry as the output format. From this output profiles windows, you can choose to convert DVD to BlackBerry Q10/Z10, Bold 9900/9930, P'9981, etc. Tips: This updated version supports profiles of as many as 300 media players including the latest smartphones and tablets. So you can feel free to rip DVD to iPhone 5/SE/6s/7, Microsoft Surface, Nokia Lumia, HTC One M10, Samsung Galaxy S7/S6, iPad Mini 4, Xbox One, etc. Hit the "RUN" button to start to rip DVD on Mac. You can view the DVD ripping progress and cancel it at anytime. For DVDs entangled with copy protection technology, MacX DVD Ripper Pro makes them emancipated from these annoying measures, which works as a DVD decrypter and helps you copy DVD for your BlackBerry with 100% quality reserved, so that you can enjoy whatever DVD movies on BlackBerry as you like. New movie DVD releases are all supported. Tips for iOS users: MacX MediaTrans helps transfer DVD movie file to iPhone iPad etc. in extremely fast speed. Besides, it can transfer video from iphone to Mac, and many other media file, like photos, music, books, podcast etc. to free iPhone iPad iPod space or to backup. Notice: We only advocates using this best DVD ripper to rip commercial DVDs to Blackberry under the concept of Fair Use and does not encourage any illegal reproduction or distribution of copyrighted content. Please abide by the local DVD copyright law before doing it. Wanna convert video to BlackBerry for playback on BlackBerry phone with ease? Keep your eyes on, in this article you will get tips and tricks of how to transfer video to BlackBerry. With a couple clicks, you can enjoy videos on the BlackBerry anytime anywhere. Wanna play DVD movies on mobile phone? This tutorial shares you a detailed and easy solution to convert DVD to mobile phones like BlackBerry, HTC, Samsung, Nokia, etc with a couple clicks. This article tells the tips to play DVD movies on Nokia with MacX DVD Ripper Pro so that you can easily rip and convert DVD to Nokia for watching anytime and anywhere.